These American Gold Eagle Proof coins have been certified and graded by NGC, and are assigned grades according to their condition and design quality. Proof variants are usually minted at the West Point facility of the United States Mint – the ‘W’ mint mark on the reverses of these coins attest to this fact. Although proof coinage was historically struck for die-checking and design-archival, they are now minted in large numbers due to popular demand among the collector community. Proof gold coins, like their bullion counterparts, are available in four weights – 1 oz, ½ oz, ¼ oz, and 1/10 oz. Each of them contains the specified quantity of 0.9167 pure gold. PF-70 is the highest possible grade for a proof coin and is given to coins that display absolutely no surface imperfections, even when inspected under magnification. NGC, or the Numismatic Guaranty Corporation, was established in 1987. It began as a relatively small third-party coin-grading agency in Parsippany, New Jersey. However, over the past three decades, NGC has become one of the most respected and trusted coin-grading authorities in the world. Moreover, it is now the largest third-party coin-grading service in the world, having graded over 35 million coins. American Gold Eagle coins were released in conjunction with the American Silver Eagles, in 1986. Ever since their release, these coin programs have become one of the most successful coin programs in the world – with buyers anxiously awaiting each year’s release. The obverses of these American Gold Eagle Proof coins feature the beautiful Saint-Gaudens portrayal of one of the most iconic symbols of Liberty in the United States of America. Seen striding forward, holding a torch aloft and an olive branch in her other hand, the image of the graceful Lady Liberty is depicted with the United States Capitol Building in the backdrop. Miley Busiek’s rendition of a family of majestic Bald Eagles is displayed on the reverses of these coins. An adult is seen returning to the nest, while the other adult looks upon it. The face value of the coin is also imprinted on this side, followed by the weight of the gold used in striking the coin. Proof coins are struck carefully, ensuring that the design print is firm and pronounced. This process results in lifelike designs that pop out, unlike any other variants of these coins. Moreover, NGC makes sure that the coins are safe from external harm and tampering by enclosing them in secure plastic containers. Furthermore, various labels in these clear cases detail the designations and certifications awarded to the coin in question, in addition to the grade assigned to it. Proof coins have long remained the coin variant of choice for collections, as their designs stand out and make the pure gold content truly stand out. 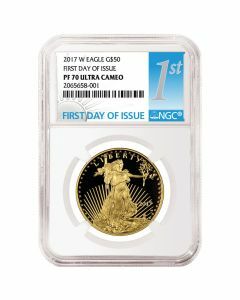 Coin collectors will love these sealed American Gold Eagle Proof coins, issued over several years, which allow coin collections to be completed with precision – with regards to the desired release, quality, and condition of proof coins.